« Back To School Team Spirit! (The text below contains my adventures of crocheting a sweater to fit my body. In no way am I disparaging the pattern or the designer, but rather explaining what it took to go from pattern to finished item with which I am happy. Back in July, I found a sweater pattern that I really liked and decided that I must make for myself. The sweater is the Madrona Cardigan designed by Rohn Strong. I absolutely loved how this pattern looked, I loved the 3/4 sleeves, and I couldn’t wait to make it for myself. I ordered my yarn and when it came in, I was ready to stitch away. the pattern and started stitching away. When I finally got to a section where there were no more increases, I was able to measure for gauge and hit my first road block. My gauge was way, WAY off. Like, two whole repeats off. This isn’t a good thing, because it meant I would use up my yarn too quickly and I wouldn’t have enough to finish the pattern. So, I did the only thing I could think of at the time and frogged it all. 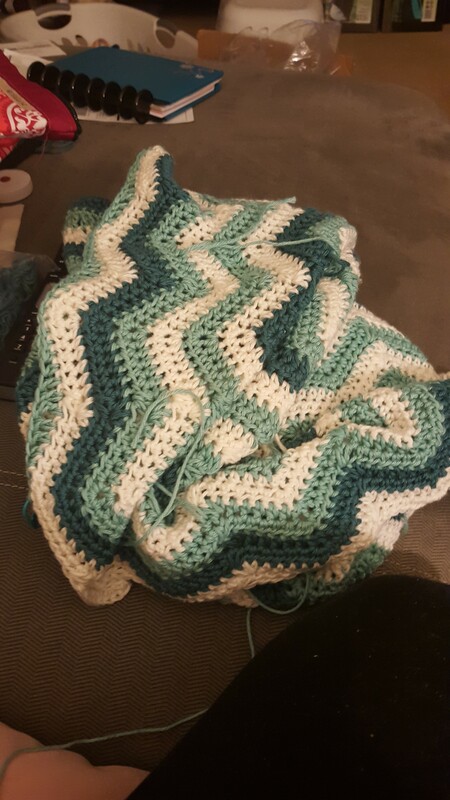 Went down a hook size and re-crocheted up to the same part. Gauge was still way off. I realized that if I wanted to make gauge, I would have to drastically reduce my hook size, and if I had done that, I would be crocheting armor and not a sweater with drape. So, I put things away for a mini time-out while I thought things over. I decided the next day to order more yarn. Risky, because I could end up with totally different dye lots. I was very lucky, however, and got dye lots that matched what I had previously ordered. I also decided that I liked the look that the larger hook created, because I didn’t want a sweater with negative ease, so I knew some pattern adjusting would be needed. Frogged again, and put the frogged yarn into baggies to save it for making the sleeves. My other reason for using the larger hook was the armhole. Once again, I didn’t want something clinging to my arm, because I personally find that uncomfortable to wear. My hope was that the larger hook would net me a larger armhole, and a more comfortable cardi wearing experience. After a solid time-out (where I was busy creating lovely new projects for Cascade Yarns), I came back to this puppy and started it once again. 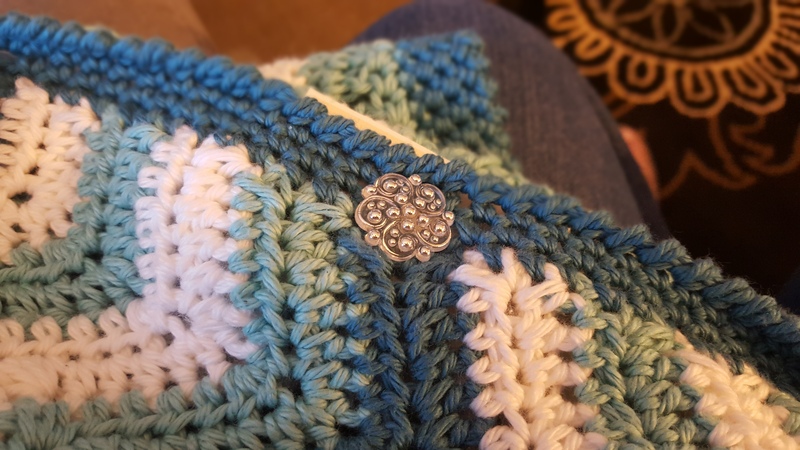 Used the 5.5mm hook and didn’t worry about gauge, because I knew it was way off what was stated in the pattern. Originally followed pattern, but added an extra increase row for the chest area, which made for 5 HDC between increase/decrease stitches, and that made the chaining for armhole change to 13. Originally stitched with three peaks for the armhole, but after doing several rounds for the body and trying it out, the back was too full and didn’t look right. So, ripped back to the row where armholes are created and went with 4 peaks for the armhole. This gives a fuller, almost bell sleeve, but that is more doable than the super full back. Stitched the sleeves with the yarn in pieces from my first two aborted attempts of the sweater. Added three more rows for the sleeve so it ends past the elbow, then did the edging. Didn’t like the look of the DC as called for in the pattern for edging, so went with Hdc for the first round, then crab stitch for the second. After finishing sleeves, went back to stitching the body of the cardi. Added 5 extra rows to increase length. Also changed pattern for bottom of sweater – did one row in pattern before doing one row to create flat edge, because sl st didn’t show as much against same color. Main portion of cardi is now complete. Need to weave in lots and lots of ends, then do edging. Once cardi is edged, will take it to local craft store to find the perfect buttons. 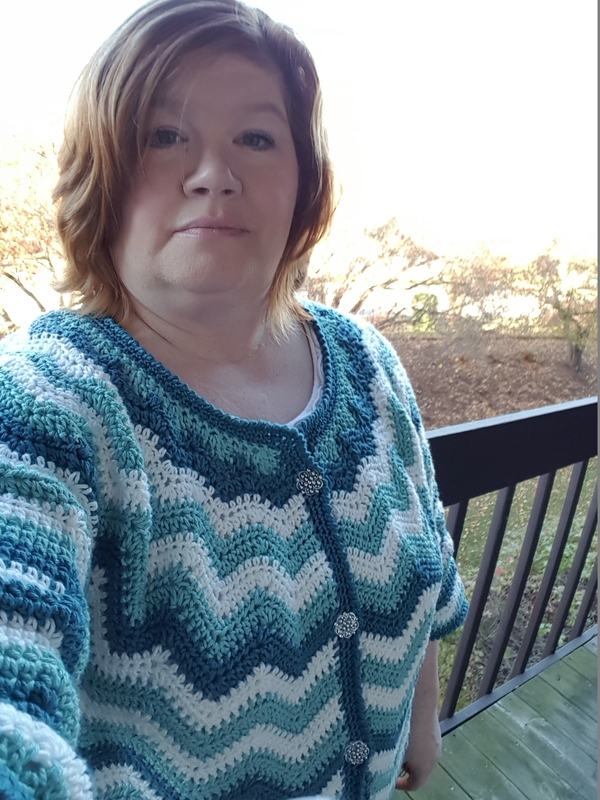 I like the pattern, and I love how my cardi fits and looks on me, but it took A LOT of pattern adjusting to get a fit that I was happy with. So why share all this? Because it is okay to go off pattern when needed to make something that you will be happy wearing. Sometimes following the pattern exactly will make you a pretty garment, but if it doesn’t fit or look right, it will spend more time stuffed away in a drawer rather than on your body, and all that time you spend making it will have gone to waste. For the most part, this is a well written pattern. It was easy to follow all the instructions. But if all I did was follow the instructions, I would have either (1) run out of yarn and wouldn’t have been able to make the sleeves or (2) made something that I spent lots of time on and wouldn’t be able to wear. It was worth it to “break the rules” and make personal adjustments to the pattern, because I love what I made, I know it is going to be the fit I wanted, and I can’t wait to wear it again and again. Have you ever had to do this with a pattern? I’d be interested in hearing your pattern fit stories.